Customs officials in Aizawl said that gold bars worth Rs. 32.27 crore were seized this year alone in Mizoram, the largest ever gold haul in Mizoram. Mizoram witnessed largest ever gold smuggling this year with gold bars worth Rs 32.27 crore seized by customs officials. “Before 2015 gold smuggling was almost unheard of in Mizoram, no sizeable seizure was recorded pre-2015. On December 14, 2015 there was an instance when one smuggler was allegedly robbed by Assam Rifles personnel. It was alleged that unidentified gunmen including the Assam Rifles personnel robbed a gold smuggler on the outskirts of Aizawl,” Customs officials told Northeast Now. The then commandant of the 29th Assam Rifles Colonel Jasjit Singh and other 13 persons were arrested in connection with the robbery. Customs officials said that 52 gold bars worth Rs. 14.5 crore were snatched from a certain smuggler; the incident triggered a sensational case which included the army officials stationed in Aizawl. This year alone, there have been six gold seizures by customs officials. According to the customs officials in Mizoram these seizures are worth Rs. 32.27 crore. “Mizoram has become a route of gold smuggling, the Directorate of Revenue Intelligence has been trying its best monitoring the porous boundary with very limited manpower,” sources said. 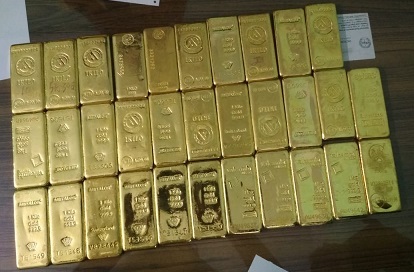 On April 21, in the biggest haul in Mizoram the anti-smuggling unit of the Aizawl customs division seized 29 kg of illegal gold bars at Muallungthu, on the outskirts here and arrested one person in connection with this. Deputy Commissioner of Aizawl customs division James Guite said that the contraband were valued at Rs 9.16 crore based on the prevailing rate of gold bullion. With the state sharing the international border with Myanmar, Mizoram has emerged as a gold smuggling route. Last year, the customs division had seized 8.3 kg gold bars worth Rs 2.5 crore smuggled along this route.